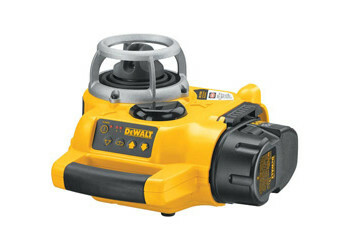 Dewalt Self Leveling Rotary Laser - Combo Kit (Int/Ext). Fully automatic horizontal & vertical self leveling with out-of-level shutoff eliminates user error, ensures accuracy, and reduces set up time. Multi-voltage adapter accepts all DEWALT batteries 9.6V - 18V. Protected rotary head & weatherproof design deliver interior & exterior jobsite durability. Bright, sharp, high power beam delivers maximum visibility, even over long distances. Remote control operated scan mode creates a "laser chalkline" between two points for an extremely bright beam over long distances. Wireless (IR) remote control operation so that one person can setup and aim the laser over long distances. Digital laser detector detects rotary laser beam over long distances or in bright light conditions. Heavy-duty kit box (w/ padded interior).